Do not want to lose your music? iCopyExpert makes them safe. Why copy from iPod to computer? When your computer system crashes, hard disk fails, or any other problems occur to your computer, you will lose all your favorite music, your playlists, ratings and play count. How to protect them? Yes, make a complete backup of your iPod. iCopyExpert can do this for you. Copy your music and videos out right now and they will be safe. You do not need to spend a long time ripping CD files onto computer, arranging them one by one and rating them again. 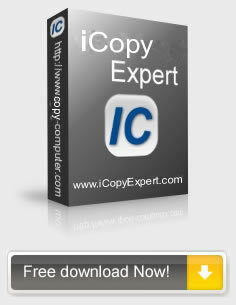 Use iCopyExpert to copy from iPod to computer quickly and easily. With iCopyExpert, you can also transfer your music and videos from iPod to iTunes, including your playlists, ratings and play count. Download it right now and get complete control of your iPod! Support all kinds of iPod, iPod Touch, iPhone and iPad. 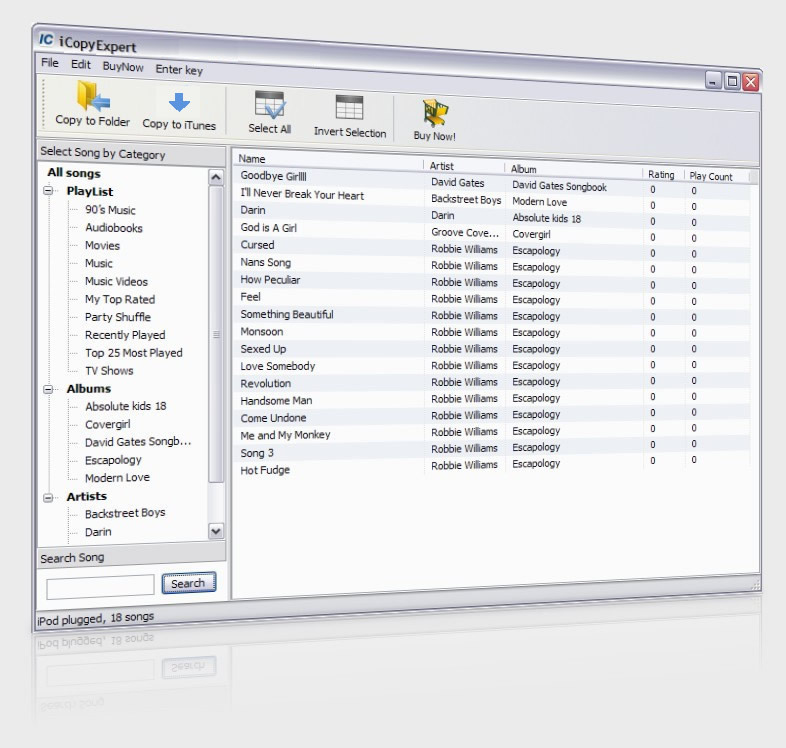 Copy music and videos from iPod to any folder on your PC. Transfer music and playlists back to your iTunes Library. Easy to use, simply select music and click "Copy to computer" button. Simply read data from your iPod and risk free. Quickly find whatever music for copying by Artist, Album and Playlist. iCopyExpert is the Quickest & Easiest way to do this! iCopyExpert fixed my problem! I have about 1600 songs in my iPod. Well, a couple of weeks ago, I was ready to play some iPod music and noticed that ALL my songs were gone. I didn't do any sync or erased anything when I was last in iTunes. Should be easy to fix, I thought. I searched on the internet and fortunately, I found iCopyExpert finally. I was overjoyed when I saw all my 1600 songs back in your software! Even my playlists, ratings to each song have also been saved. Thank you guys for such great work! This is the best iPod software I have ever tried. It does exactly what is advertised and the backup of my iPod music is perfect. I will definitely recommend your software to all of my friends and family. Thanks so much for your help on Christmas holiday! Last week, when I organized my hard-disk space, I deleted some folders on my family computer. The next morning, my son told me that he couldn't find any his iPod music he backed up on the computer. My son was so upset on Christmas day and he even didn't wanna talk with me. He said he couldn't sync his ipod and iTunes anymore, otherwise, all his music collection would be removed. At that time I had come to know what a big mistake I'd made. Sigh...But your iCopyExpert gave all my son's music back when I installed it on the computer. Thank you for your most helpful software and it really saved the relationship between my son and me. I must say what a pleasant experience I have with your software. A couple of days ago, my friend told me that her laptop crashed and she lost all her favorite songs after she connected her ipod with iTunes. Then, I felt that I must do something to back up my iPod music before a hard disk failure happened to me. But, I always fear to use almost any software, cause I've never been comfortable with those professional computing instructions. So, I wish I could find some most easy-to-use app for myself. And your iCopyExpert is. It took me less than 3 mins to install on my computer, and just within a couple of clicks, I had a complete backup of my iPod content. I was very impressed and best wishes for your continued success! Step 2. Plug your iPod to computer, iCopyExpert will detect your iPod automatically, and show all songs, playlists, ratings and play count. Step 3. Click 'Copy to Computer' or 'Copy to iTunes' button. Step 4. Well done. Your songs, playlists, ratings and play count will be copied to computer or imported into iTunes.